Posted April 19, 2018 by Treeium Inc.
13 Reasons why these life hacks can help you save the planet and a little cash this Earth Day. 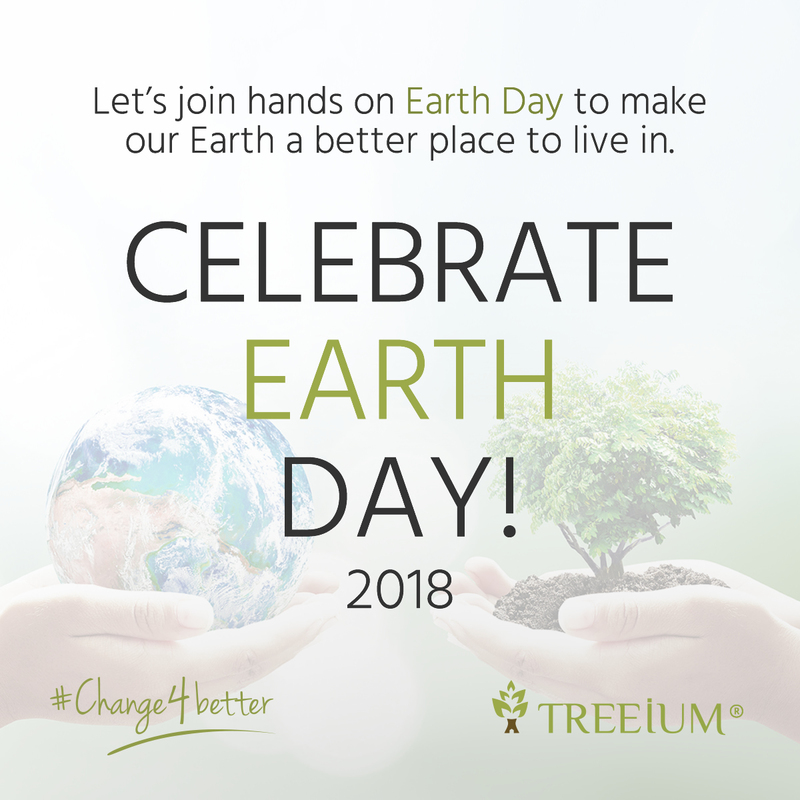 With Earth day 2018 fast approaching us on April 22nd we at Treeium would like to share a few simple life hacks that you can implement to your daily lives that are easy on the environment and on your wallet. So feel free to share with your friends and family as we can all work together to make this world a better place. It’s easy as 1-2-3. Replace the halogen lights throughout your home with LEDS (light-emitting dodes). This will not only curb your energy consumption, but it can also save you major bucks on your electricity bill. LEDs can also last up to 10 years, which means you won’t have to run to the store every couple of months to replace them. We at Treeium call that a win, win. The next time you’re out shopping, grab a reusable bag to place your items in. Plastic bags account for a drastic amount of pollution in local waterways and public areas. Help keep our cities clean and curb your single bag use all in one swoop. Some grocery stores will even reward you for shopping with a reusable bag. Yay rewards! Make a conscience effort to bike, walk, run or hike at least once a week. Nature is all around us even in the biggest cities in our country. Walk to lunch one day or ride your bicycle to your favorite coffee shop instead of firing up the whip. Your body will thank you and so will the environment by producing less Co2 emissions. Americans throw away more than 50 billion plastic water bottles every year. Bringing your own water bottle to hydrate during the day is good for your skin, will energize your muscles and help save our oceans. Saturdays and Sundays are for Farmers Market shopping! Find a local market near you for local, organic produce. From apples and cucumbers to seasonal apple cider donuts, get organic foods for the fraction of the grocery store cost. Buying locally supports regional agriculture and dramatically cuts down on the carbon emissions caused by food shipments. #TreeiumTip: Grab your reusable shopping bag before you hit the market! 9. Hands off that Thermostat! Did you know that fluctuating your thermostat uses a ton of energy? Next time you’re too hot or cold, shift it one degree and save roughly one percent on your energy bill and keep cool while looking cool. Stop using chemical cleaners in your kitchen and make use of your pantry items instead. There is no need for chemical cleaners to clean your kitchen counters; baking soda and vinegar can work miracles in your kitchen. Oranges and vinegar also work like magic and leave your kitchen smelling great. Own stainless steel appliances? #TreeiumTip Use cream of tartar and white vinegar to clean your steel appliances without causing damage to the finishing. These aromatic must-haves for delicious curry dishes, biryani and many types of cooking can also be used to repel certain pests like cockroaches, flies, wasps, mosquitoes and ants. The Bay leaves (Litsea glaucescens) have a pungent odor that these bugs don’t like so place them in suspected spots around the house. Forget the bug spray. It may seem annoying to turn your PC or laptop on and off every day, but this simple act can save both energy and money. Throughout the day, try turning the monitor off when not in use and make sure your printer and scanner are also turned off too. For centuries humans relied on towels for cleaning up around the home. Then paper napkins, towels and cloths came along and landfill waste is the result. There’s no need to cut down threatened forests for simple spills. Get back into the habit of using washable cloth towels and napkins to help the environment.